Kiosk+ is an upgrade to the Jibble Attendance Kiosk. Kiosk+ extends the basic features by adding an additional layer of security passcodes and allowing you to use the iPad Kiosk offline as well if there is an unreliable wifi connection or the iPad is placed in an area with no internet connection. When offline mode is enabled, your data will be stored only on your device. You can see this by the icon in the top left corner. Note that as long as your device is in Offline Mode, all entries made in that mode will not show up on the website, or via other devices, as it is not connected to the cloud. You will have disable Offline Mode (and connect to the internet) to synchronise your data with the web app (app.jibble.io). We recommend to do this at the end of every workday if possible. When enabled, the In/Out Log will be hidden from all team members. If you use the attendance Kiosk in public places, you can also setup a screensaver with or without a special password so only staff members will be able to view the system. 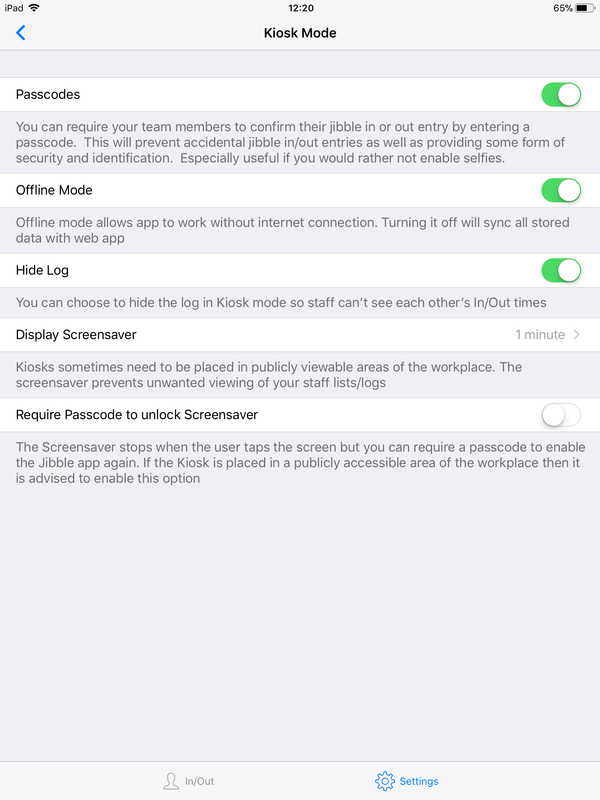 If you are using Passcodes then you can also enable a staff member's passcode to be used to unlock the screensaver too. Read more about that in this help article. You can add team members from different teams in one kiosk. Read more about that in this help article.